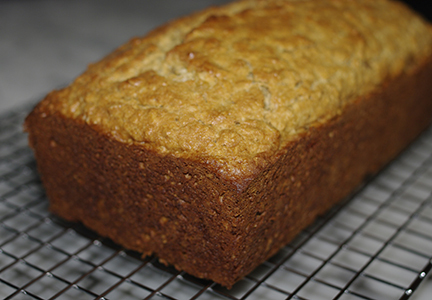 This is a quick bread to put together and for all its simplicity, the flavor is very complex. There is the oat-y taste, but also a spicy-sweetness from all of the candied ginger. It's a really yummy bread to serve from breakfast to dessert. It's very moist and almost cake-like. I'd never heard of Broonie until I came across the recipe in Whole Grain Baking, but it's now something that I want to make again and again. Preheat the oven to 350F. Grease an 8 1/2 by 4 1/2 loaf pan. Whisk together the oats, flours, brown sugar, baking powder, ginger and salt in a large bowl. With a fork, two knives, or a pastry cutter, cut in the butter until the mixture resembles coarse cornmeal. In a separate bowl, combine the eggs, buttermilk and molasses. Stir this mixture into the dry ingredients, stirring until the batter is evenly moistened. Stir in the crystallized ginger. Spoon the batter into the prepared pan. Bake until a cake tester inserted in the center comes out clean, 50 to 55 minutes. Remove from the oven and cool on a rack. After the Broonie is cooled, remove from the pan and wrap well; it's best to hold it overnight before slicing, if possible. I've never heard of broonie either, but it looks and sounds delicious!